I thought I had the revolutionary idea of using memes to engage with my students on the IR theory courses I teach but it turns out Dr Jack Holland has already beaten me to it! 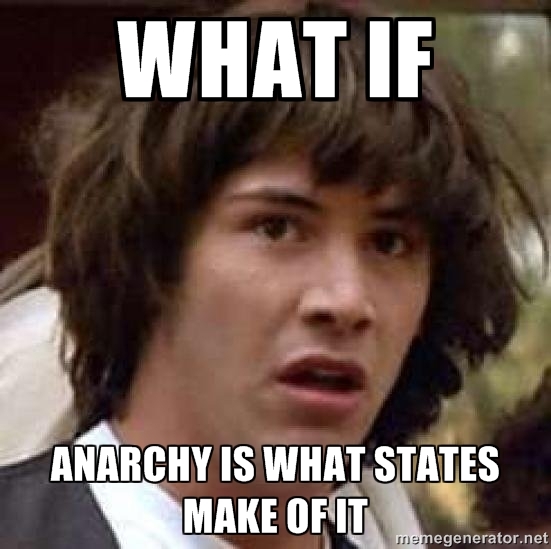 I’m a bit worried that my students won’t be quite as nerdy as me and won’t get the whole meme thing, so if anyone out there has tried teaching IR/politics using memes then it’d be good to hear how it went down! We had an informative comment on the previous post which is worth re-posting as a follow-up on the map discussion. //If anyone else has a favourite projection do send them on, and I’ll post them here too! Here are some useful resources for teaching geopolitics, political geography and constructivism, using the Mercator projection (the standardised map that we’re all pretty used to) and showing how far its representation of the world distorts our understanding of that very same world. The Economist have produced this fantastic map of Africa, with other states mapped on top, to illustrate just how much bigger it is than we think and are used to. It would be a great resource for teaching gender and/or constructivism! As someone who studies ‘security’ in the United States and China rather than the country where I actually live, coming across the following information from the MI5 discussing how they understand ‘national security’ in the UK was particularly interesting. They note the lack of a clear definition of ‘national security’ in either UK or European law, while adding that this has been a deliberate and consistent practice of successive UK governments and parliaments to ensure flexibility. The discussion that follows is both thoughtful and reflexive – features academics often make careers out of claiming governments lack. The piece also states that government policy is taking the term national security to mean ‘the security and well-being of the United Kingdom as a whole’. This is then extended to emphasise not just the survival of the physical state itself but also its ‘citizens’ – wherever they are, and the system of government itself. The discussion shows much needed recognition that the meaning of ‘security’ remains contested and is far from clear cut or obvious. It also shows an awareness of the role of political actors in constructing security threats. 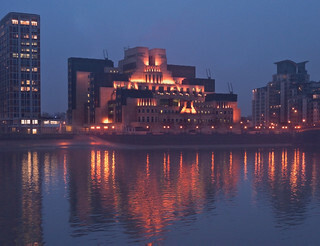 Of course, as it comes from the MI5, the focus is on more traditional notions of security. While the focus on citizens is encouraging, particularly alongside the growth in critical academic work emphasising the need to move away from military security to secure human beings, it also raises a number of questions. What does it mean to protect UK ‘citizens’ rather than human beings more broadly defined? What does this mean for the rights, security and well-being of individuals living in the UK who do not have the protection of citizenship? What about the security and well-being of migrants and asylum seekers? And lastly, what are the moral and ethical implications of a security policy that distinguishes between the security of ‘citizens’ and human beings? Russell Brand has been waxing lyrical about revolution in his recent editorial for New Statesman. It’s worth a read and there’s a thousand and one things in there that could be a point of discussion here but it was a few paragraphs that caught my eye, particularly seeing as though Russell Brand seems to be giving IR theory a go. It seems like he’s in to a bit of constructivism. So for Brand, ideas are important and things we take for granted as being ‘real’ are entirely made up. His assertion that these ideas are, however, separate to an ‘actual reality’ puts him in line with most ‘mainstream’ constructivists rather than more ‘radical’ constructivists like post-structuralists. “The reality is we have a spherical ecosystem, suspended in, as far as we know, infinite space upon which there are billions of carbon-based life forms, of which we presume ourselves to be the most important, and a limited amount of resources. Here he’s bringing up a couple of points about politics not only being state/nation-centric but also human-centric; arguing for a rethinking of humans as the referent of politics and security and shifting it towards the environment. His suggestion of some kind of inclusive spiritual ideology being used to do this speaks to recent debates about security cosmopolitanism.